Bruce Nauman's 82 square foot white concrete construction Square Depression installed for Sculpture Projects in Munster Germany. 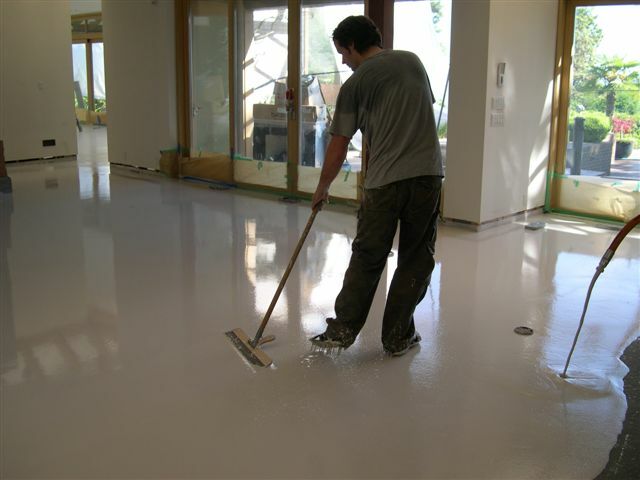 There are several ways to get a white floor, most of us who want a white floor and have researched the available options will know this to be a daunting quest; most ceramic tiles are not pure-white (even when they are labeled as such), latex or vinyl floors may discolor if they lack UV resistance. Timeless Terrazzo is becoming more and more a lost art and happens to be exquisitely expensive. And finally, there is concrete, often just haphazardly part of the construction process, often bestowed with total ignorance. As it happens, we love concrete, the brutal yet minimalist sincerity of this material which conceals nothing. 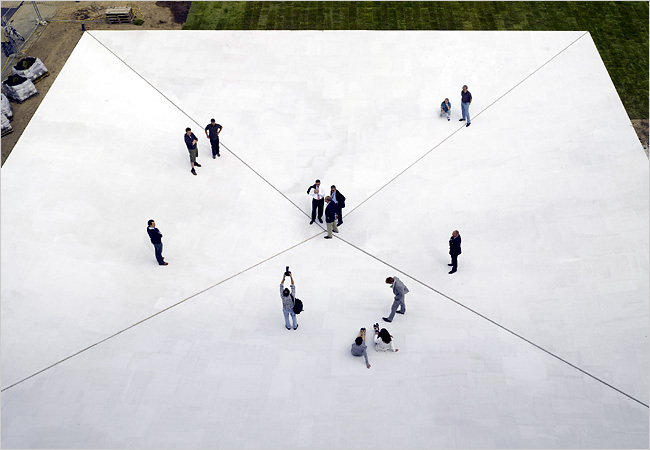 There is the pure naked type of concrete, which Tadao Ando uses, but there is also the art of white concrete. White concrete is the holy grail for every modernist, often brushed off as an impossibility, yet a viable option for those with persistence. If you have ever been through a lengthy and frustrating construction process, you will know what it means to have construction people who take pride in their job. When it comes to concrete, this becomes an even bigger issue. 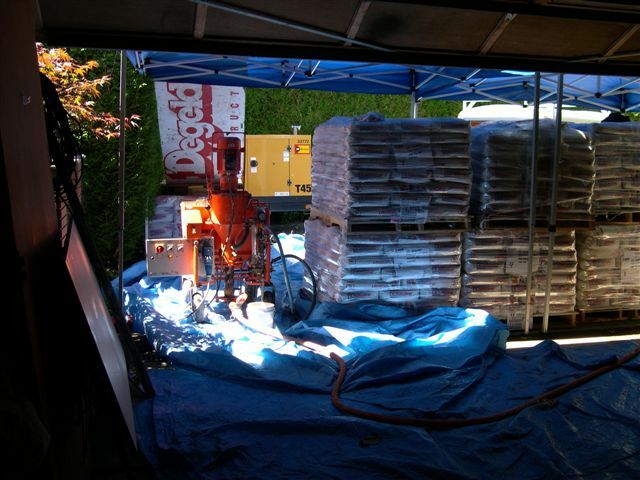 This story is about a company that specializes in white concrete and takes pride in their craft. 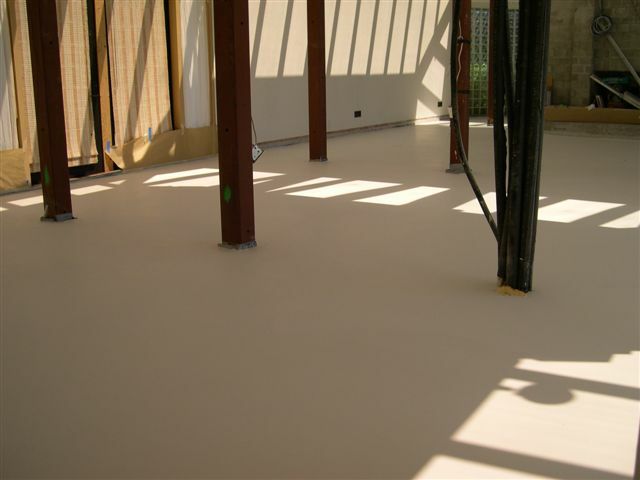 Most architects and contractors will sound a resounding "no" but everything can be accomplished, even a white concrete floor. So if a Sloppy-Joe-type-contractor tells you "white concrete cannot be done" or "every concrete floor will crack", you can proof them wrong. Artisan Concrete Systems is a firm that really is proud of their craft and they take great price in their craftsmanship. 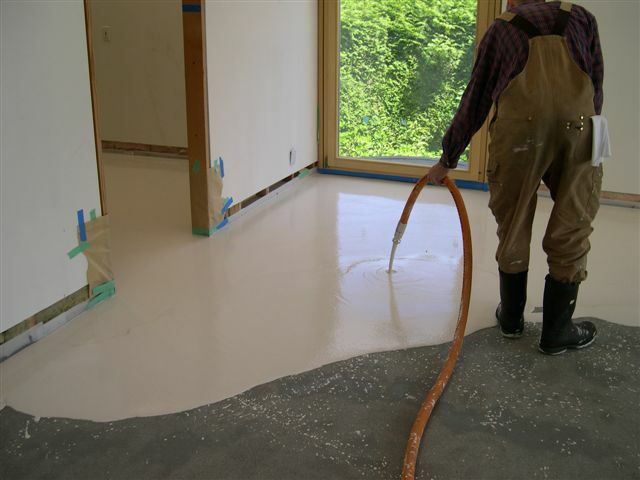 They are basically a nice bunch of young guys who specialize in the precise art of pouring white concrete, just for the heck of it, I guess because every other contractor said it couldn't be done. You would think that they are located in a small Swiss watch-making town with all this talk about precision work; the good news is that they are located in Vancouver Canada and often do jobs on the East Coast. And, since they appreciate modern architecture, you don't need to worry about them getting all Victorian on your behind. 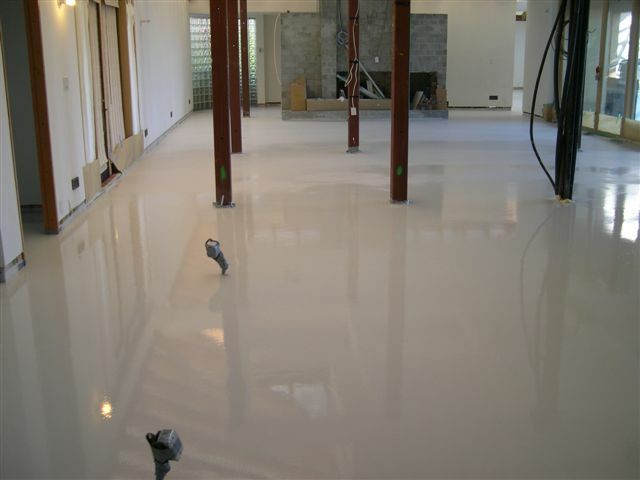 Elevations were shot and hieght markers were installed at key points, allowing us to produce a floor level to within 1/8" tolerance over 10feet, with concrete installed at constantly varying thicknesses ranging from as little as 1/4" to over 1 1/2" deep. 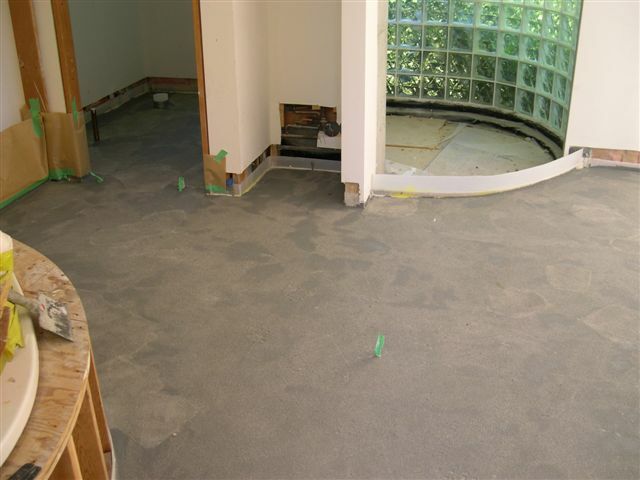 The prepped floor, prior to concrete with elevation marker. 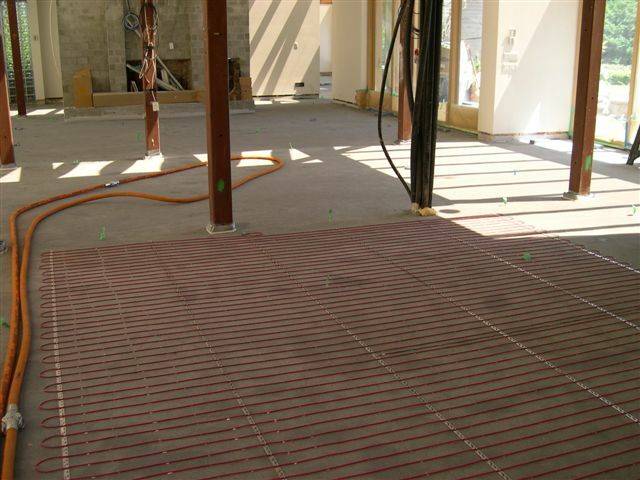 Radiant heating system is laid out. Cement mixer is ready to rumble. Slow and steady will get you ready. White concrete floor nearing completion. Behold, the most perfect white concrete floor! To our Artisan Concrete Systems credit and to their customers delight- there are absolutely no significant cracks in this floor. A good example is this upscale residential installation presented a unique set of challenges. The existing concrete was in very poor condition; cracked and disbonded throughout. In some areas the radiant heat pipes were actually above the surface of the failing concrete topping. 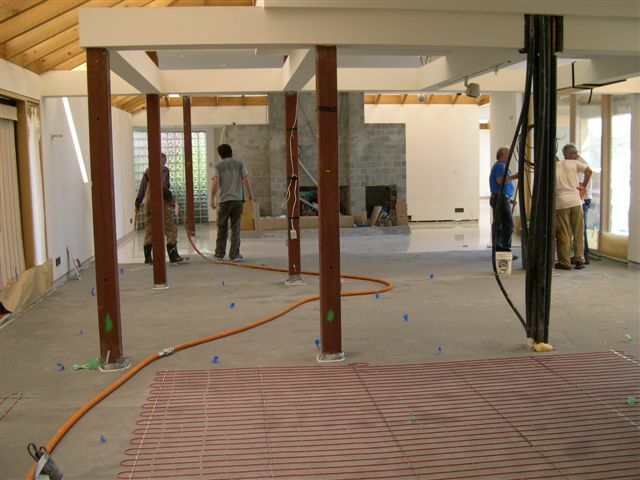 First, the existing floor was repaired using fundamental anchoring techniques common to the industry. 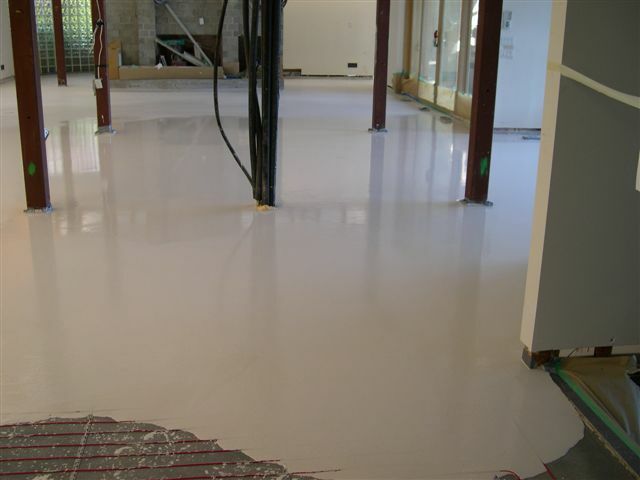 We then compounded an anti-fracture membrane system using Mapei products, which we used to bridge the entire surface of the previously cracked and disbonded floor. Great care was taken to reduce stress at all key points by installing a number of countermeasures throughout, to further eliminate shrinkage cracking. 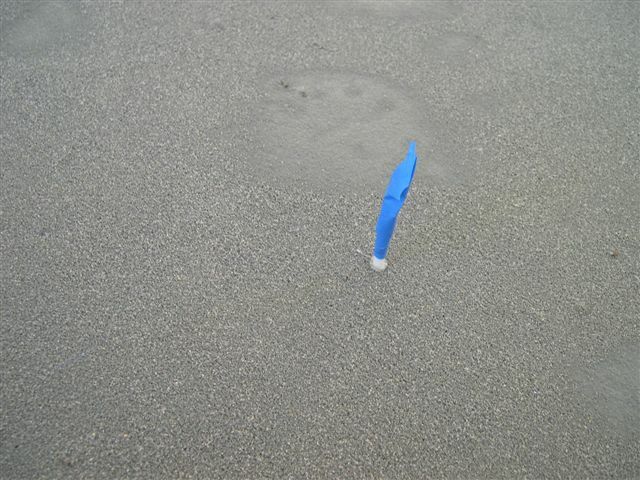 Due to the extremely lax timeline for completion, the membrane system was then left, for 12 months. The cracks did not re-occur in the substrate.